It’s the time of the year for yard work, and maybe you have a summer’s worth of yard waste filling up bags in your garage. Or maybe you’re ready to take on a project before summer ends and you’re wondering where to recycle your yard waste. We can help. While recycling rules vary by city, recycling is incredibly beneficial to the environment and worth looking into! Although recycling rules do vary by city, the Environmental Protection Agency (EPA) has a lot of great tips for recycling yard and wood waste so it doesn’t end up in a landfill. When this happens, it contributes to global climate change, but it also takes up space and produces methane gas. When you burn yard waste such as leaves or trimmings, not only is it a fire hazard but it also creates air pollution. To avoid these, check your city or town’s website for a proper place of disposal. 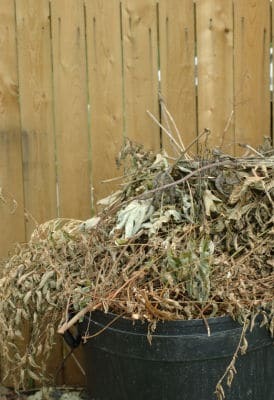 A step up from recycling is reuse, and what better way to avoid the need for recycling than by reusing your yard waste? You can avoid a trip to the local compost and you don’t have to worry about filling up your car with bags and bags of leaves, weeds, or tree trimmings. Plus, reusing is a lot easier and less time consuming! Make mowing the lawn easier by taking part in the Grasscycling campaign. Instead of bagging up your grass clippings after mowing, leave them on the lawn where they will decompose and return nutrients back to the soil. Just make sure to avoid cutting grass less than one inch. Another great way to reuse is with dried leaves or shredded wood waste. You can use these to make mulch. Spread mulch in thin layers around the base of plants. This prevents weed growth, retains water, adds nutrients back to the soil, and regulates soil temperature. You can do the same with grass clippings. Since food and yard waste make up for 20 to 30 percent of what we toss, we should be composting these items instead which keeps these materials out of landfills. Compost is organic material that can be added to soil to help plants grow, such as dead leaves, twigs, branches (browns), grass clippings, vegetable waste, fruit scraps, and coffee grounds (greens). Since many of us use these items on a regular basis, it’s easy to get a compost bin started. Compost piles should contain equal amounts of browns to greens, and layers should be alternated between the two groups. The brown items provide carbon and the green provide nitrogen. To create backyard compost, you need a dry, shady area near a water source. Add brown or green materials and moisten as they are added. After a compost pile is created, mix green waste and grass clippings into the pile and bury fruit and vegetable waste under 10 inches of compost material. You may also choose to cover the top with a tarp to keep it moist. Your compost will be ready to use when the material at the bottom is dark in color! If you don’t have the space in your yard for an outdoor compost pile, just purchase a compost bin and store it in your home! For more information on creating a composting pile, please check out some tips from the EPA. Want To Make An Even Bigger Impact On The Environment? Reducing, reusing, and recycling are three amazing ways to help the environment. Why wouldn’t you recycle a vehicle when you’re done using it? If you have a vehicle to sell, trade in, or dispose of, please consider donating it to Wheels For Wishes. Your vehicle, running or not, will be auctioned off or recycled and the earned proceeds will benefit Make-A-Wish. Car donation is green and generous – it’s a win-win for all! To donate, call 1-877-431-9474 or fill out an online donation form.